FILE - U.S. Senator Rob Portman, R-Ohio. A U.S. Senate investigation has found that federal authorities failed to protect undocumented children who entered the United States without an accompanying adult. In a prepared statement before the Permanent Subcommittee on Investigations Thursday, Senator Rob Portman (R-OH) said that the Department of Health and Human Services' (HHS) process for releasing unaccompanied children to sponsors, who in some cases exploited them, suffers from serious, systemic defects. HHS Acting Assistant Secretary Mark Greenberg told the hearing that the agency has instituted new procedures aimed at preventing abuse of minors once they are released by the government. FILE - U.S. 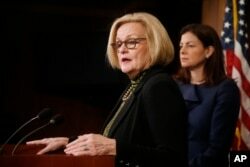 Senator Claire McCaskill, D-Mo. Portman and Senator Claire McCaskill (D-MO) initiated the probe, prompted by a case in Portman's home state of Ohio in which at least six children from Guatemala were forced to work long hours on egg farms in Marion County. Six people have been charged in the case. Other cases of abuse of children after their release from government custody to guardians are under investigation by the subcommittee, Portman said. "It is intolerable that human trafficking - modern-day slavery - could occur in our own backyard," Portman said. "But what makes the Marion cases even more alarming is that a U.S. government agency was responsible for delivering some of the victims into the hands of their abusers." Over the past two years HHS has placed about 90,000 migrant children, most of them for Central America, with adult sponsors in the United States, Portman's statement said. President Barack Obama's administration has been criticized for its immigration policy some say encouraged a surge, which rose significantly in 2015. Critics said it caused a major logistical problem for American officials who struggled with the influx.